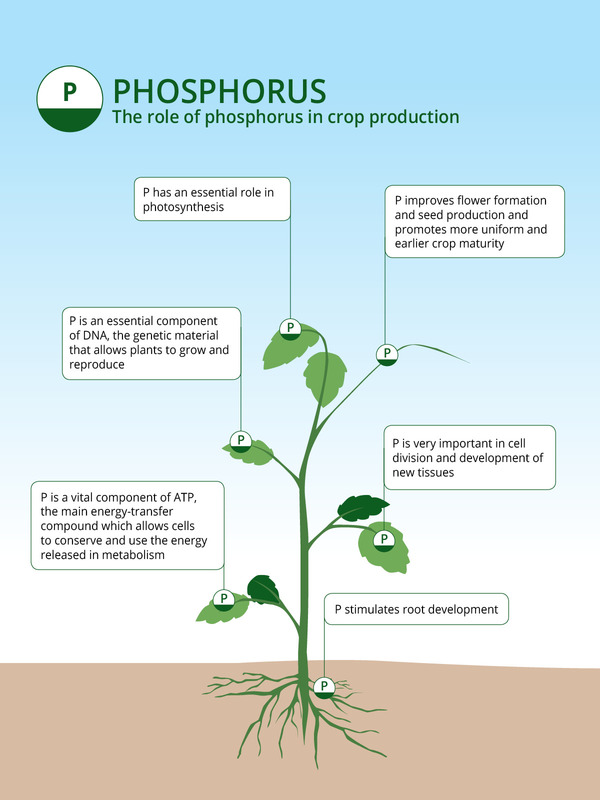 Phosphorus (P) is an essential nutrient, both as a component of several key plant structural compounds, and as a catalyst in numerous key biochemical reactions in plants. Phosphorus is noted especially for its role in capturing and converting the sun's energy into useful plant compounds. Phosphorus is a component of various enzymes and proteins. It is a vital component of DNA, the genetic "memory unit" of all living things. It is also a component of RNA, the compound that reads the DNA genetic code, to build proteins and other compounds essential for plant structure, seed production, and genetic transfer. The structures of both DNA and RNA are held together by phosphorus bonds. Phosphorus is a vital component of ATP, the "energy unit" of plants. ATP forms during photosynthesis, has phosphorus in its structure, and participates in processes from the beginning of seedling growth through to seed formation, and maturity. Phosphorus is essential for the general health and vigor of all plants. Some specific growth factors that have been associated with adding phosphorus to the crop are: stimulated root development, increased stalk and stem strength, improved flower formation and seed production, more uniform and earlier crop maturity, increased nitrogen-fixing capacity of legumes, improvements in crop quality, and increased resistance to plant diseases. A crop deficient in phophorus will show slow growth, appear stunted and be weak. Older leaves will have a dark green color and purple pigmentation. 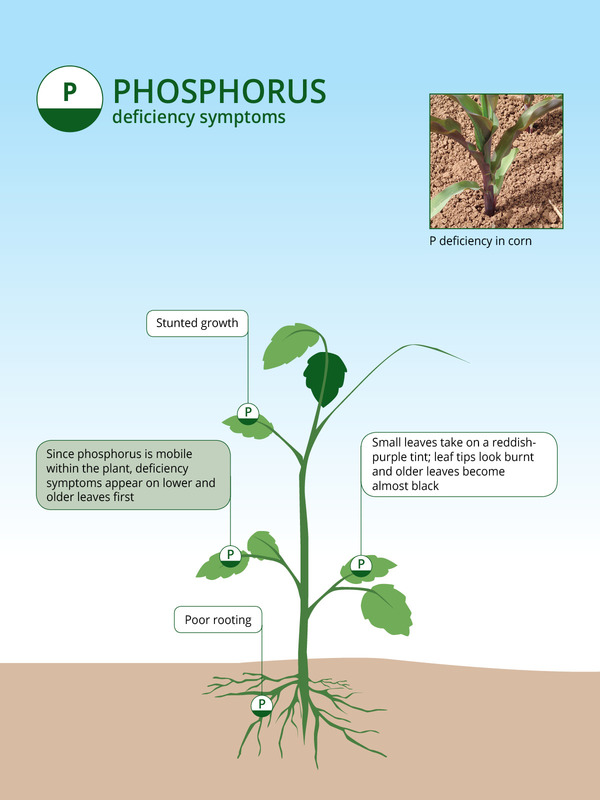 Since phosphorus is mobile in the plant, the bottom leaves are always affected first and show the earliest signs of deficiency.